It seems too early for Halloween, but this movie is undeniably very promising and something every moviegoer should watch out for. 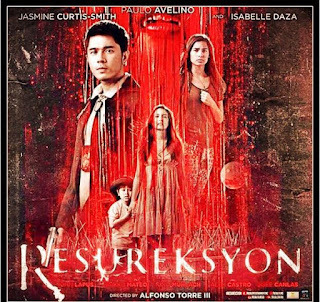 With a powerful cast led by Isabel Daza, Paolo Avelino, and Jasmine Curtis Smith, “Resureksyon” is a highly anticipated action-thriller vampire movie that is flavored by a heart-piercing sad reality about OFWs. Upon seeing the official trailer, many fans have already been so excited for the convincing performance of the two leading ladies in their dramatic scenes; while there have been girls eager to see more intense bullets-and-blood action performances of Paolo Avelino in this movie. Even Jasmine Curtis Smith will be seen using a gun in this latest Regal Entertainment masterpiece. The story of this action-packed and bloody horror film is basically about one of the OFWs who unfortunately returned home lifeless and “packaged” in a coffin. During her wake, everyone was severely shocked when she suddenly got “resurrected” but appeared to be in strange behavior. Much worse, it is seen in the movie trailer that she has actually turned into a vampire and that she’s not the only one who got into this terrifying transformation. The story then evolves into a vampire horde versus silver-bullet-armed slayers battle. How come Isabel Daza’s character became a vampire and how come the vampires quickly grew in number? Well, these are just some of the questions answerable once you have watched this exciting movie. Directed by Alfonso “Borgy” Torre III and written by Jimmy Flores, Mary Rose Colindres, Ruel Montanez, and Dwight Gaston, the movie will be shown in theaters nationwide on September 23, 3015. Other stars in the cast include John Lapuz, Raikko Mateo, Niño Muhlach, Alex Castro, and Gee Canlas. This pre-Halloween offering of the year is definitely worth your money, time, and effort to see this making a huge wave in the big screens.